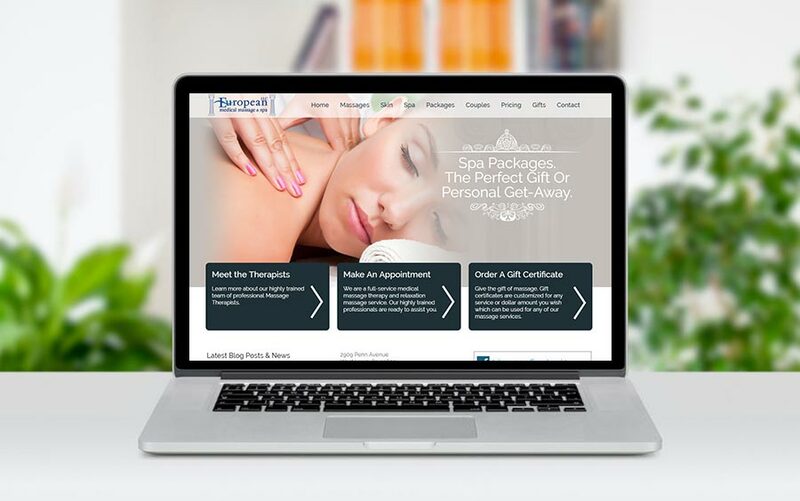 We recently redesigned European Medical Massage & Spa’s website. This is a medical massage and spa located in Berks County Pa. He decided to call the us based on a referral from another website customer’s excellent experience and results. This owner’s previous website was built in flash, which is a coding technology that can be aesthetically pleasing, but not optimal for search engine results. He really wanted to take his business to a new level with social media marketing, tapping into automatic updates to his newly created Facebook, Linked-in, and Twitter accounts. He also wanted to incorporate a little e-commerce into the website so visitors and customers could purchase gift certificates online. Also, he wanted to integrate his newsletter subscription form with an email newsletter service so that when a customer opts in to receive a newsletter, they will automatically be subscribed without the owner having to manually enter the customers information (thus skipping this tedious task that he was currently doing for each subscriber) Finally, he also wanted to integrate a cell phone texting program where subscribers could opt in to receive special promotion alerts send by text message to customers cell phone. Bill, I needed to get away from the old website I was using because no one could even find it online. You told me all about the benefits of search engine friendly design, and you were right! I now rank #1 for my targeted keywords in Google! Thank you, and I will refer you to everyone I know. I get lots of business now from the website!